Ben Henthorn volunteers at the Beloit Fine Arts Incubator (BFAI) from 10 a.m. - 2 p.m. Monday through Friday. 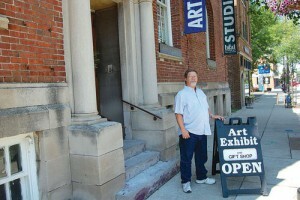 He also serves on the BFAI Board of Directors and hangs art show pieces each month as the new exhibits change. There comes a time in many lives when a saving grace not only saves us from ourselves, it gives us purpose and peace. For Ben Henthorn, the grace began long ago with an interest in art. The saving came much later. Ben is a 1973 graduate of Beloit Memorial High School, a veteran of the U.S. Air Force and a 1999 graduate of Upper Iowa University. His working years included jobs as a security guard and a juvenile justice corrections officer. These days, however, he can most often be found at the Beloit Fine Arts Incubator (BFAI) in downtown Beloit. From 10 a.m. to 2 p.m. Monday through Friday, Ben and his lakeland terrier keep the operation going. He also serves on the BFAI Board of Directors and hangs art show pieces each month as the new exhibits change. Ben also holds the liquor license for the establishment and serves as bartender on the Friday night exhibit openings each month. He does not get paid for these services, and has been volunteering at the incubator for nearly eight years. “He spends over 1,000 hours per year, year after year,” said Jerry Sveum, BFAI Board President.“It’s an amazing commitment. We’ve had our ups and downs here but through it all Ben has been here. He’s probably responsible for the ups,” Sveum said. Ben’s life hasn’t always had such consistency. Due to health issues he was “medically retired’’ early from the Air Force after three years. He had become an assistant crew chief conducting inspections of C130 aircraft before take-offs and after landings while in the Air Force. After leaving the military Ben studied art education at the University of Louisiana and worked. However, taking a full class load, working, being married and struggling with epilepsy proved to be too much and he dropped out of school. He also went through a divorce. In 1988 he moved back to Beloit and continued his education earning a bachelor’s degree in law enforcement and public administration. He then worked as a corrections officer in the then Rock County Juvenile Detention Center. Fate, however, turned his life around once again in 2004-2005. “I was in a motorcycle accident. I was hit by a drunk driver early on a Sunday morning,” he said. Ben ended up hospitalized for more than three months. After being examined by physicians through the Veterans Administration, he was deemed disabled. “It’s like my life was on the fast track. I was done with the Air Force at 25 and then I was done working in my forties,” he said. As a result, he spiraled deep into depression. Ben needed to find a purpose to keep going. He was told by the professionals trying to help him to find something interesting to do and to get out of the house. A friend whom he had previously worked with told Ben about the BFAI. He visited, but most often couldn’t find anyone available to talk to about getting involved at the BFAI — as it also struggled to get its operation grounded. And that has made all the difference. Ben not only began his daily volunteer duties, he also began partaking in classes in water color, pottery, photography and carving. And, equally important, “I’ve made a lot of friends and acquaintances,” he said. Ben has a daughter, Abigail Jorgenson, an award-winning artist herself and a student at the University of Wisconsin-Oshkosh. Abigail also volunteers, helping her dad at the BFAI and at the Bristol Renaissance Faire.